Maybe it goes back to my sister putting a dead one in my dresser drawer as a kid (but then I had chased her with a toad, and so scared her that her muscles in her feet spasmed and she couldn't walk and had to go to the ER). Or one too many finding their way into my house leaving me screaming, shaking and wildly swinging a tennis racquet int he dark~ I shut off the lights and opened the door for the bat to get out... and more came in. Whatever it is, I do not like bats. No matter how many mosquitoes they eat. I will admit I went looking for images for this post and I am still feeling the heebie jeebies. 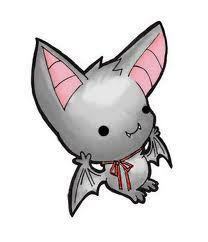 And I typed in 'cute bat'! But in the interest of not perpetuating fears, I always speak bravely to Rowan when bats are the topic (which they are more than you might think!). So, last week while driving home from skating lessons, and pretending to be bats (it was dark), I explained echolocation. That bats didn't really see all that well at night, but rather, echolocated to find their way about. And after reading bedtime stories as upside-down as we could get without actually being bats, I thought we had put the bats to bed. Jump forward to Saturday. At a dinner party with friends. Four kids are playing downstairs (three 5 and one 3 year old). Suddenly, the basement erupts with a cacophony of shrieks and screams. Panicked adults jump up and then pause, realizing it is not pain or alarm. One brave mom heads downstairs to figure out what on earth they are (still) screaming about. She comes upstairs, baffled. Apparently, she relates, they were being bats. They had all the lights off and were running around, flapping with toys and pillows scattered all over the floor. And they were screaming. One dead bat in your drawer hardly even comes close to the hundreds of frogs/toads that have chased me with. However, bats are much harder to catch. I have to thank Barney the Barn cat for her assistance with that one!